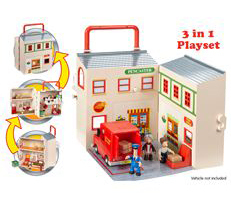 The Postman Pat Deluxe Pencaster Playset makes clever use of double hinges and scenery cards to transform into Pencaster Square, The Post Office and the SDS Sorting Office. At the end of the day the set folds in on itself and can be neatly packed away; it even has a carry handle. Character’s Deluxe Pencaster Set includes three Postman Pat figures; Mrs Goggins, Ben Taylor and Pat himself. The set also includes several accessories including parcels, mail hoppers, a desk, till and computer screen. This deluxe Postman Pat set also features a parking space reserved especially for Pat 1.